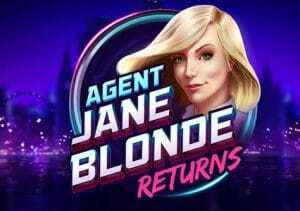 One of the most popular online video slots of the 2000s was Agent Jane Blonde and now Microgaming’s super spy is back for a second adventure in Agent Jane Blonde Returns. This sequel is a 5 reel, 15 payline video slot complete with respins with sticky wilds. Play this low variance game on your PC, tablet or mobile from between 5p and £400 per spin. The original Jane Blonde video slot featured comic strip design. This second outing is a far more sophisticated looking affair. The reels are set against a night time city skyline backdrop. There you’ll find a collection of items that a spy would use to ply her trade. They include watches passports, laptops, luggage and guns. More rewarding is Agent Jane in a variety of scenes and disguises. Agent Jane herself is the game’s wild. She spins in stacked formation in the base game, appearing 3 or 4 symbols high. The wild replaces all other symbols with the exception of the logo scatter. Wilds are central to the game’s only extra – the Respins feature. To trigger it, you need to land 2 or more scatters on the same spin. Those scatters morph into wilds and reels spin again. If a new wild symbol lands, it too is held and another respin follows. The respins keep on coming until there’s a spin where no new wild lands. A final payout calculation is then made with all of the extras wilds in place. There aren’t any free spins here but the respins round is a more than adequate substitute thanks to the sticky wilds. Saying that, you can only win 300 times your total bet on each spin/respin if you manage to fill the reels with wilds which is low. The first Jane Blonde game was pretty straightforward and Microgaming has kept to a similar formula here. The visuals are a step up from the original but the features are pretty simple and the volatility is low. That combination of basic features and low variance won’t be to everyone’s taste. If you enjoyed Agent Jane’s first mission, then this sequel won’t do anything for you. I would much rather play other Microgaming titles such as Immortal Romance and Jurassic World which offer bigger potential wins and better bonus features.